A large portion of the United States population is aging, leading to a growing demand for medical professionals such as radiology technologists. This makes these next few years both an important and rewarding time to pursue a career in radiological technology. In the small state of Rhode Island, there are 1,000 workers of this occupation, and their numbers continue to grow as this state follows the national rising trend for the healthcare sector. In fact, industry estimates project that the need for radiologic technologists in the US will increase by 12% in only a decade. According to the Bureau of Labor and Statistics, the average annual salary for a radiological technology professional in Rhode Island is currently $68,300, with an average hourly wage of $32.84. This is significantly higher than the national average annual salary of $60,320, and puts Rhode Island among the nation’s top-paying states for this profession. Like other northeastern states, however, Rhode Island generally has a high cost of living. More information on Rad Tech salaries in Rhode Island. The state of Rhode Island currently requires all working radiological technicians to be licensed. Each license lasts for a 2-year term, and must be renewed before it expires. In addition, this state requires mandatory continuing education, which involves 24 hours of course work per term in every specific radiology profession. 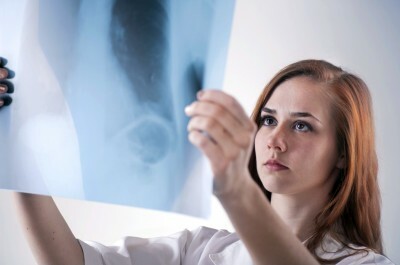 Prospective radiologists have the option in Rhode Island to take either the state certification exam or the national American Registry of Radiologic Technologists (ARRT) examination, which is also used in 36 other US states for licensing. Located in Lincoln, the Community College of Rhode Island offers its students an Associate of Applied Science degree through its Diagnostic Medical Sonography and Clinical Laboratory Technology programs, which are a part of its Allied Health Department. The programs only accept 80 new students each term, and take 24 months to complete. The application process is usually very competitive, so be prepared. Graduates of these programs are eligible to take both the state and JCERT certification exams to receive their license. Like many hospital education programs, the Rhode Island Hospital School of Diagnostic Imaging offers Certificate and collaboration programs, including concentrations like Magnetic Resonance Imaging and Nuclear Medicine- all of which are accredited by JCERT. Some programs, such as the Radiologic Technology program, are part of a collaboration with Rhode Island College to offer students with a Bachelor of Science degree in the field of Radiology. In a joint program with the local Rhode Island Hospital (see above), Rhode Island College offers students the formal education and program structure to receive a Bachelor of Science degree through its Radiologic Technology program. Available concentrations include Nuclear Medicine, Sonography, MRI, RT Computed Tomography, Radiologic Technology and Medical Imaging Management. The clinical education and training aspects of this program is provided by the Rhode Island Hospital. Several major healthcare centers are located in Rhode Island, and all consistently hire radiological technology professionals. While large hospitals provide the majority of radiologic technologist employment, numerous smaller facilities hire radiology technologists as well. Both aspiring and working radiologic technologists alike in Rhode Island should consider joining a professional organization such as the Rhode Island Radiology Society (RIRS), which offers membership benefits including network ties, career support and volunteer opportunities. The American Registry of Radiologic Technologists (ARRT) is also worth a look and is a good reference for radiologic technology education and training.